Regeneration is also covered by indicators for SFM. Photo: S. Linser. Sparked in part by the Rio Earth Summit of 1992, the use of criteria and indicators (C&I) for sustainable forest management (SFM) has become an ever more present aspect of forest management. “The role genetics/genomics research can play in forest management is huge but, unfortunately, remains under-utilized,” said Dr. Om Rajora, Professor of Forest Genetics and Genomics at the University of New Brunswick, Canada. A. Controlled pollination in black spruce to produce F3 progeny at Petawawa Research Forest; B. DNA fingerprints of 10 individuals each of white spruce (WS), black spruce (BS) and red spruce (RS) at a genic microsatellite showing genetic diversity; C. Sampling of old-growth and post-harvest second-growth black spruce to examine the genetic effects of forest harvesting and renewal practices in Manitoba (Rajora and Pluhar 2003, Theor. Appl. Genet. 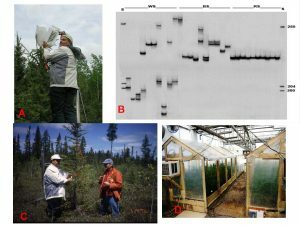 106: 1203-1212); D. Testing of three-generation outbred pedigree of black spruce under ambient and elevated CO2 conditions for QTL mapping of traits related to acclimation and adaptation to climate change. All pictures were taken by Dr. Om Rajora or his associates. “Genetics/genomics research can greatly assist the management of natural and planted forests by conserving healthy, productive, well-adapted and genetically diverse natural forest and developing high yielding tree varieties with desired traits for deployment in plantations,” he said. Now they say that about the climate – but they’re a lot more serious. The rapidly changing climate will precipitate related changes throughout nature. And that includes the world’s forests. 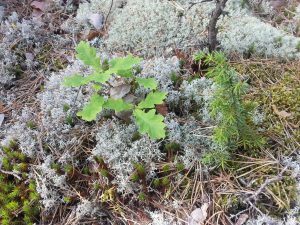 Anticipating climate change impacts on forests and adapting policies and management strategies to mitigate those impacts is critical to maintain the health of those forests and, by extension, of the earth. “Forest management for adaptation to climate change” is the theme of a session being presented at the 24th IUFRO World Congress in Salt Lake City this fall, by Drs. Rodney Keenan of the University of Melbourne, Australia; Carina Keskitalo of Umeå University, Sweden; Kalame Fobissie of the World Wildlife Fund Central Africa, Cameroon; and Guangyu Wang of the University of British Columbia, Canada.